The identification and development of talented young players has become a central concern of football clubs at all levels of the professional game, as well as for national and international governing bodies. 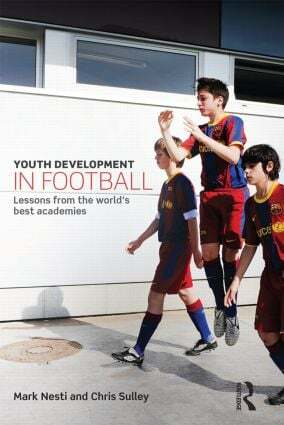 This is the first book to offer a comprehensive survey and assessment of youth development programmes in football around the world, to highlight best practice, and to offer clear recommendations for improvement. The book draws on original, in-depth research at eight elite professional football clubs, including Barcelona, Ajax and Bayern Munich, as well as the French national football academy at Clairefontaine. It adopts a multi-disciplinary approach, including psychology, coaching and management studies, and covers every key topic from organisational structures, talent recruitment and performance analysis to player education and welfare. Written by two authors with extensive experience in English professional football, including five Premiership clubs, this book is important reading for any student, researcher, coach, administrator or academy director with an interest in football, youth sport, sports development, sports coaching or sport management. Mark Nesti is Reader in Sport Psychology at Liverpool John Moores University where he is also head of the MSc programme in Sport Psychology. His current research interests are focused on identity, meaning and critical moments in sport. Mark was formerly the counselling sport psychologist to the first team at Bolton Wanderers (2003-7) and at Newcastle United FC (2007-8) and Hull City AFC (2008-10) in the Premier League. Chris Sulley is Head of Coaching (5-13) at the Everton FC Academy where his focus is on developing the coaching skills and competencies congruent with the club's playing and coaching philosophy. Chris is a former professional footballer, starting his career in a very successful youth development programme at Chelsea (1972-81) before moving on to Bournemouth (1981-6), Dundee United (1986-7), Blackburn Rovers (1987-92), Port Vale (1992-3) and Preston North End (1993-5).